My good friend Ute came for dinner, she is German, I am Franco-Italian and we have exactly the same tastes, likes and dislikes as far as food and cuisine is concerned. We love the same flavors and dishes so it’s really a pleasure to cook for her, I don’t have to think for days about the menu. We both don’t like sweets too much but agree that a meal needs to end by a dessert, so I had to come up with something that would be filed in the dessert category without being too sweet. When planning a dinner for picky people which becomes more of a headache than a real pleasure, it’s a sign that your guests are food un-educated, which is not the case for Ute and she is definitely my favorite guest to have around. Voilà, j’ai trouvé mon dessert! et en plus c’est léger! Originally were supposed to try a new restaurant called George known for its seafood specialty dishes, then the rain started to pour and even though je ne suis pas en sucre as we say in French (I am not made out of sugar therefore will not melt), we decided to not go out…because after all I might melt, well the mascara will since the wind broke all my umbrellas. 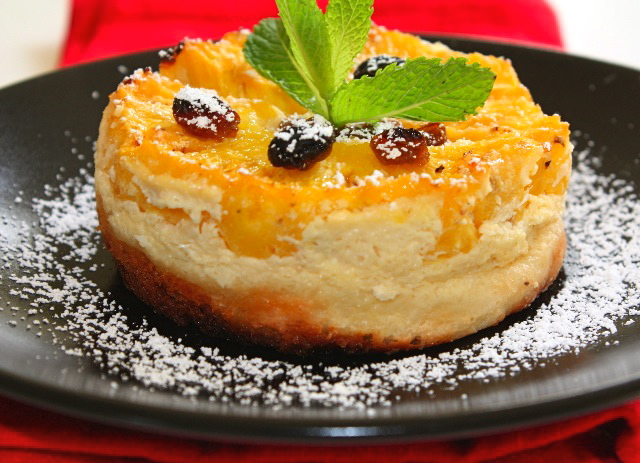 For those who are not much of a sweet tooth and who like light desserts, this one is really for them. I loved it even better the day after while it was chilled. No heavy frosting, not a lot of sugar, just natural, fresh flavors due to the fresh pineapple and coconut milk. I love to use fromage blanc in this dessert, but hard to find in the US, so I mainly substitute Fage Greek yogurt in any recipe requiring fromage blanc, either the 2% or the regular and it works perfectly. I used brioche as the “crust” instead of a regular pâte brisée or pate sucrée which resulted in a moist and semi-soft texture crust which also absorbed the coconut/fromage blanc mixture. You can serve it with some vanilla ice cream if you want, but I kept it “light”. You can use individual deep molds or a large one, I prefer individual portions, it feel like everyone gets a whole full dessert and is a controlled portion. Cover the bottom of the molds with brioche ensuring there is no space in between each slice of brioche. In a pan, heat coconut milk and reduce a little. Remove from heat, add fromage blanc, egg and sugar. Mix well. Add coconut flakes. Mix all ingredients to obtain a smooth texture. Pour on top of brioche. 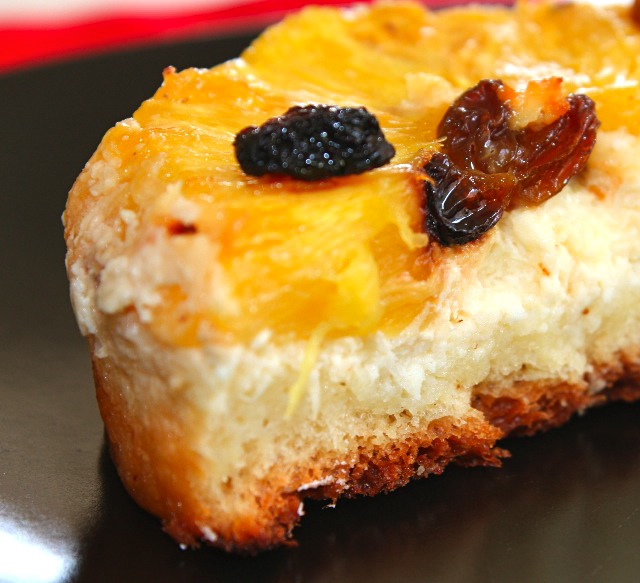 Add pineapple slices and sprinkle with raisins. Cook in a pre-heated oven at 370F for about 30-40 minutes, until the mixture has thickened. Remove from the oven, let it cool. Sprinkle with powdered sugar. Eat at room temperature or chilled. This entry was posted by silvia on April 29, 2010 at 9:38 am, and is filed under Desserts. Follow any responses to this post through RSS 2.0.You can leave a response or trackback from your own site. I love the combination of tropical flavors with the delicate fromage blanc and yummy brioche here! What a delightful dessert! Marvelous use of the brioche for the tart. I adore fromage blanc. Luckily I don’t have trouble finding it by me, I have at least two places that consistently stock it for me. Love the flavoring, coconut, pineapple, golden raisins. My wife would absolutely dig this…so I guess I’ll be trying it out this weekend. Well, you are speaking my language here because I hate overly sweet desserts that obliterate the taste of the savory meal you just had. This is my idea of a perfect dessert. I have found fromage blanc at Whole Foods – maybe have a look? have you tried making your own fromage blanc? mmm great recipe and beautiful desert!! wonderful delicious and refreshing dessert, it looks nothing like I would expect by the ingredients, I was thinking it would be like bread pudding somewhat…but this is gorgeous! Wow, that looks amazing delicious. yogurt and coconut, what great combo. Those tarts looks so good and those tropical flavors sounds scrumptious. Beautiful and Easy…perfect for warm weather! Thanks again! Oh goodness, this is a beautiful recipe! You never fail to please. I enjoy the voice in which you write. Yes, it’s difficult to enjoy a meal with company that’s just not very imaginative! =) I’m going to save your quote in French about about not being sugar and melting. Such a beautiful dessert with not many ingredients. I’m saving it to my recipe file…I need to try it! Just the right amount of sweet for me (except when I am craving chocolate, which doesn’t count). This looks just lovely! I can’t wait to give it a try.